some time ago i promised to repost some of the pics which got lost when i closed my galleries. during the holidays i found the time to make new screenshots. Wunderschöne Bilder, Du Perle von Berlin. step by step i will add more pics to this thread. 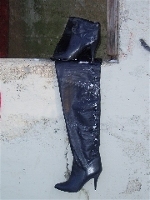 I was wondering if you have a video available of you walking with your thigh high boots in the water and mud. from the set you posted.